A new research report published by Transparency Market Research states that the global optic connectors market is set to grow at a high pace in the coming years. The report, titled “Fiber Optic Connectors Market - Global Industry Analysis, Size, Share, Growth, Trends and Forecast 2015 - 2021”, discusses the market drivers and explains in detail the reasons supporting the growth of this market. According to the research report, the global fiber optic connectors market was valued at US$2.7 bn in 2014 and is estimated to reach US$4.4 bn by 2021, growing at a CAGR of 7.40% from 2015 to 2021. The primary growth driver for the global fiber optic connectors market is the advantage of transmitting extremely high bandwidth, which eases out the process of carrying an increased information load. The global fiber optic connectors market is segmented on the basis of type, application, and geography. The types of fiber optic connectors used in the market are SC, LC, ST, MPO/MTP, and others. Applications of these connectors are seen in the telecom industry, datacom, DWDM systems, the medical sector, lasers, and others. Geographically, the global fiber optic connectors market is segmented into Europe, North America, Asia Pacific, Latin America, and the Middle East and Africa. According to the research report, the telecom industry held the biggest share in the global fiber optic connectors market in 2014. Analysts predict the global fiber optic connectors market will be fueled as they are being used for the transmission of huge volumes of data and transmission over long distances. 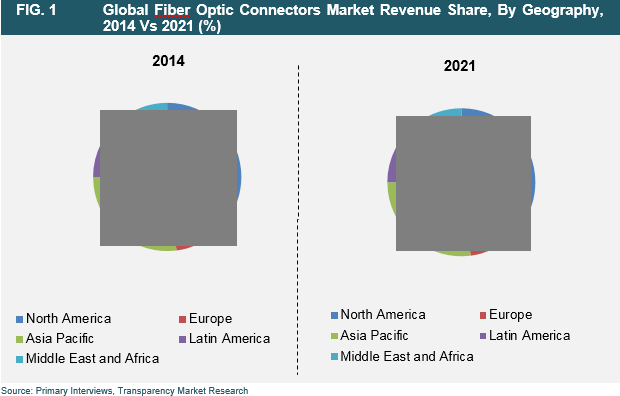 Geographically, North America dominated the global fiber optic connectors market in 2014; the North America fiber optic connectors market accounted for 38.20% of the global market. This dominant market share was the result of increasing usage of multi-fiber connectors with high density in numerous data centers. Furthermore, Asia Pacific held the second place with a share of 30.60% in the overall market in 2014. Technological advancements in cabling technology are expected to drive the Asia Pacific fiber optic connectors market in the near future. The research report profiles some of the important players in the global fiber optic connectors market such as TE Connectivity Ltd., Alcatel-Lucent SA, 3M, Amphenol Corporation, Arris Group Inc., Hirose Electric Co. Ltd, Furukawa Electric Co. Ltd, Avago Technologies, Hitachi Ltd., Sumitomo Electric Industries, Sterlite Optical Technologies Limited, ZTE Corporation, Corning Cable Systems LLC, Diamond SA, and Ratioplast Electronics, among others. The report gives a detailed explanation of the financial overview, research and development activities, list of existing products and the ones in the pipeline, and the investment outlook for the near future. In a comprehensive overview of the global fiber optic connectors market, the report also explains the competitive landscape of the market.